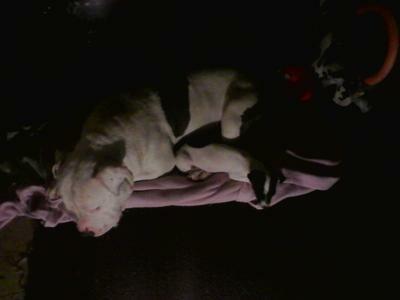 My bluenose is named Kilah. He has a personality like I never imagined. Kilah is the smartest, most lovable, playful, protective dog I've ever come across. 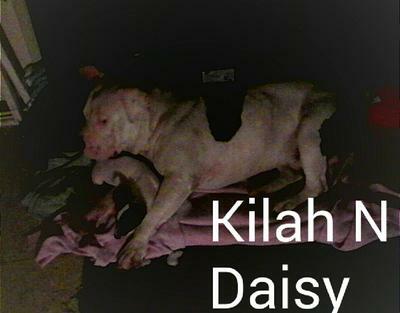 My uncle gave me Kilah when he was about 8 months old, trying to ease the pain of my last dog being stolen. Kilah and I bonded instantly, he keeps me company when my boyfriend is at work. I wash him every week, his blankets too, he is infatuated with mice and continuously hunts and chases them down. Its hilarious to watch. I cannot keep any mirrors in my room because he goes crazy not recognizing himself, he thinks its another dog...He loves toys like his tootsie roll lollipop, his one eared bunny, and balls. It seems like he understands when I talk to him because of the way he responds. He is going to be 1 yr old in about 2 weeks. The way he sits is the cutest thing ever. Oh wow. She is so cute. I cannot understand why people are reluctant towards pitbulls. They are so delightful!